UNIVERSAL SPIRIT.--Means the universe of conscious mind and self-determination. The Universal Subjectivity means the Creative Medium of the Spirit, or the Subjective law of the Universe. Particularization means the world of matter and forms. Read again the explanation to Chart Number One. The descent of Spirit means the passing of Spirit into form;--the particularization of Spirit into many things. The point, drawn from the top of the chart to the bottom section, symbolizes the Unity of all Life. Spirit passes through Law into Form. Multiplicity comes from Unity, but never contradicts Oneness. The many are within the One. Man's life partakes of the Divine Nature, and this chart may be used in the Individual or the Universal sense. Our conscious mind is some part of the One Conscious Mind of the Whole. The Complete Nature of God is reflected in man, and he uses the same law that God uses; for there is but One Law, as there is but One Spirit. Both God and man use the same Creative Medium or the Universal Subjectivity. It is the law of all thought and all action. Things come from One Source through One Common Law and One Common Creative Medium. We think of our lives as One with the Whole on all three planes of expression. We are one with the Conscious Mind, one with the Creative Law, and in our bodies we are one with all matter. No matter what we are treating or for what purpose, the Medium of all thought is the Universal Law. It particularizes Itself through the power of the word that is spoken into It. The word alone is conscious. The Law is Automatic and the form is without self-determination. Lesson Three: Metaphysical Chart No. III. The upper section of this chart shows how the conscious mind, or spirit of man, reflects or contemplates itself, through the medium of soul or subjectivity, into form or matter. 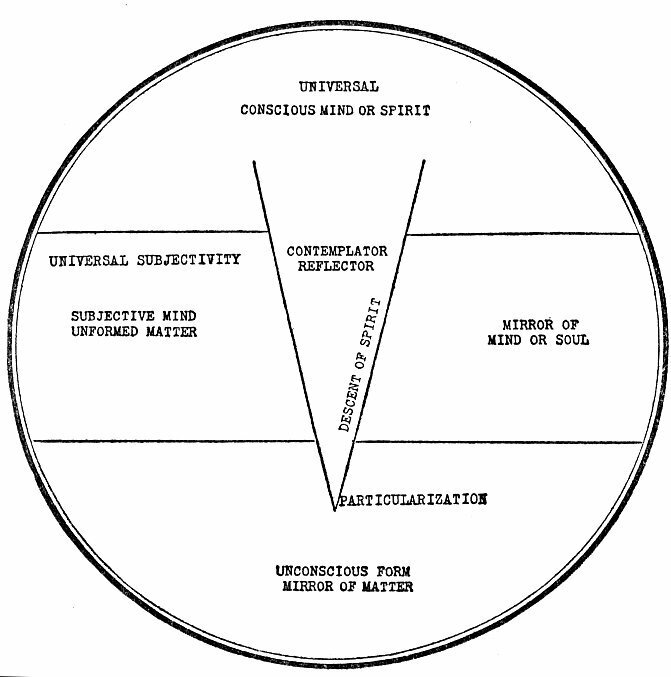 The middle section represents the World-Soul or Subjectivity; the Mirror of Mind and unformed matter; the Servant of the Spirit; the lowest section shows the result of self-contemplation as it takes form in the world of matter. Read and carefully study the metaphysical meanings of the words used in the Individual Chart. CONSCIOUS MIND OR SPIRIT.--Means the Self-Knowing Mind of the Universe. Contemplator, or Reflector, means the conscious thought of the Conscious Mind. SUBJECTIVE MIND AND UNFORMED MATTER.--MEAN THE SUBSTANCE AND THE SOUL OF THE UNIVERSE. MIRROR OF MIND, OR SOUL.--Means that the Subjective side of life acts like a mirror; that is, It reflects the forms of thought that are given It. UNCONSCIOUS FORM OR MIRROR OF MATTER.--Means that the material world reflects the forms of thought which the Soul holds before it. This depicts the Creative process and sequence:--first in the chain of Causation is the Word, and this Word is conscious of Itself; next comes the action of Law, reflecting the Word. (This Law is subjective and obeys the Word, reflecting It into form or matter; matter, being at first unformed, or a Universal unformed stuff.) It then takes form, through the power of the word acting upon It, on the subjective side of life. Soul and Substance are both subjective to the Spirit; and form, or matter in form, has no volition. In the Trinity of Unity, one attribute alone is really self-conscious, namely, the Spirit, or the Word. This chart may be used in either the individual or the universal sense, for the individual reënacts the Universal on all three planes. The manifest Universe is the result of the self-contemplation of Spirit or God. This self-contemplation, through law, reflects its images into the world of form or manifestation. Man's world of affairs and his body are the result of his inner self-knowingness. He is the result of his self-contemplation.